Once you go Chihuahua you never go back, or at least that's the case for me. There are times when I'm at a friends house and I see their big dog and I enjoy interacting with them but it always makes me even happier to go home to my little dogs. As much as I love other breeds I don't think I'll ever be able to have big dogs because I'm so accustomed to small breeds and my home is completely small breed proof. It's like puppy proofing a house for life. I never have to worry about them getting on the kitchen counter, never have to worry about them jumping a fence, and never have to deal with trying to get them in and out of somewhere by carrying them and having them be too heavy because let's face it - they are tiny. 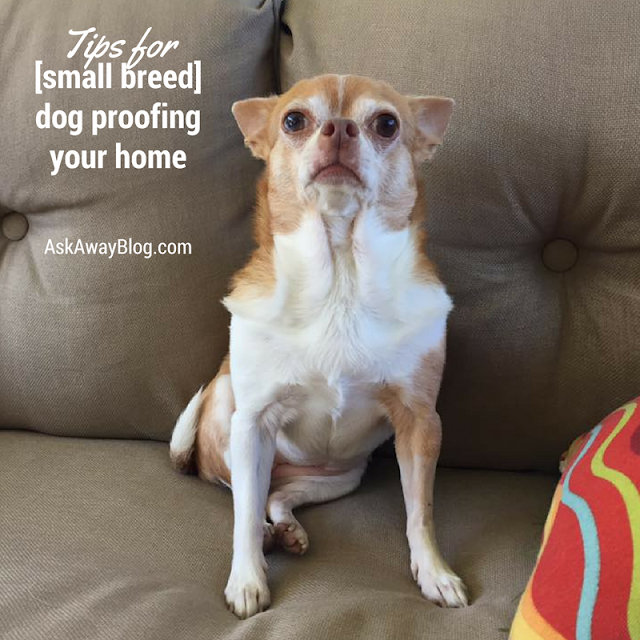 So today I have some tips on how to small breed dog proof your home. I see gorgeous floor décor in some homes like decorative lanterns or wicker baskets. But we can't have that in my house not just because Rocky might decide to lift his leg but mainly because it's easily accessible for them to get up to no good or break something. That being said, it's still really easy to just keep valuables on a higher shelf. The best part is, I know they're safe and can't possibly get knocked down unless by a tall human. Just because they're tiny doesn't mean they won't get into stuff. What might be boring for a big dog, is the perfect size and distraction for a small dog. So any kind of tassel on a blanket that hangs down to the floor, strings and thread that falls on the ground (and can get eaten and twisted in your dog's intestines), and any tiny hole in a fence that a small animal can fit through should be tended to right away. Just like with small children, cords and wires should be properly tied so that there's no loops that their little heads or bodies can get stuck in. We have really nice bamboo shades in the screened in porch but the cords hang down to the floor. I have them wrapped around little metal posts I hammered into the porch walls but when I don't have them wrapped there, I make sure they are tied and WAY up above Chihuahua level so there's no way an accident can happen. If a lamp falls over in your house and lands on your Labrador retriever's head, he's probably going to be okay and will shake it off and run away. If a lamp falls over and hits a Chihuahua in the head, it can have fatal consequences. Always make sure heavy and easily tippable items are nowhere near the danger zone. The danger zone is anywhere dogs play, sleep, or rough house. Pixie always leads the rest of the pack in a wild goose chase around the dining room. Sometimes she can bump into the wine rack, which is why all the wine is secured so nothing can fall and hurt her. When my pups seem bored like they're getting into no good it sometimes can be because they are hungry. So I like to give them a treat or two and send them on their way. However, treats can be dangerous as well and can cause choking hazards. That's why I choose an easy to consume and digest healthy treat like Grandma Lucy's Pumpkin Treats from Chewy. My pups love these! They are organic and made with human-quality ingredients and YES I've eaten a few myself. They're so good! They aren't even made in a factory, they're oven-baked. They aren't greasy or crumbly like some treats. I feel like they're just little human cookies! When you drop a rather large piece of food on the floor and your German Shepard gets it, you don't really have to worry about them choking. But when you drop a large piece of food in a multi-dog household like mine, all 4 Chihuahuas will race to get the food and try to consume it in one fell swoop. That means there's a major choking hazard so with little dogs you always have to be quick if you drop something. Also, with spills, especially of something like alcohol you better pick your little dogs up because a few licks from that puddle can be very dangerous for them, whereas for a larger breed one or two quick licks of beer may not effect them. So even though it seems like small dogs may be easier to handle, you still need to be very mindful of the potential hazards in and around your home. Do you have any tips for dog-proofing a home?